Species Ecuador, Peru. Named by E.Morren. Ken Woods 02/08. John Olsen 01/10. BSA comp. 12/11. Photo Sharon Song. 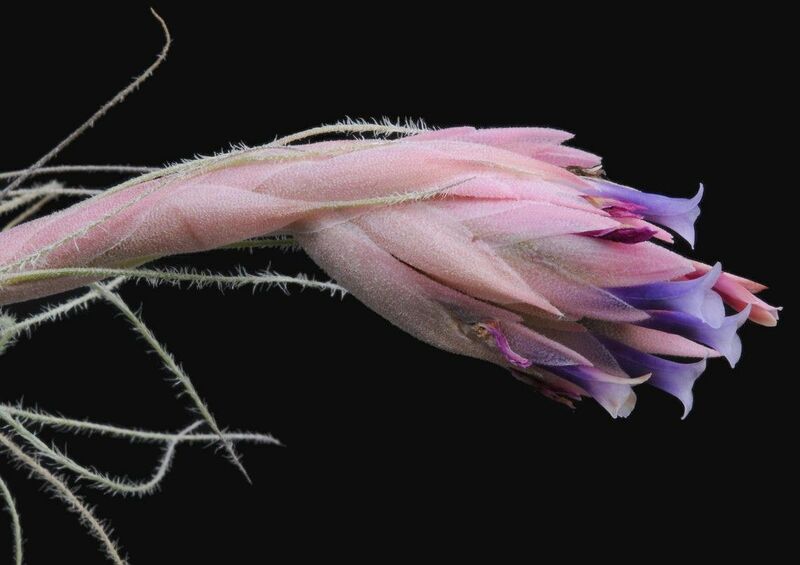 Peter Tristram ... "Yes Steve, tectorum flowers are blue (purple), usually with a white edge when fresh, then turn reddish as they age and can stay that way for some time. Your pic has one fresh flower and many older ones." Pam Butler ... "This is a Tillandsia tectorum that has been in flower for a couple of months. I was wondering if anyone could suggest a cultivar name ?" Rob Bower ... "Looks nice. Mine had a much smaller flower. Any hints on a cv name for mine would be welcome as well." Derek Butcher ... "Pam and Rob: A challenge! 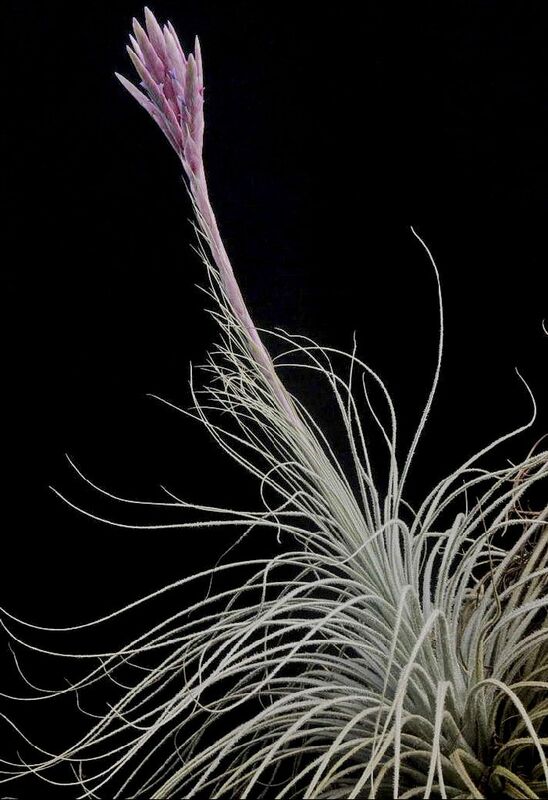 How many have grown T. tectorum from seed? I suggest none. This means we have relied on imports of live plants mainly from Knize or Germany but a bit from Isley. 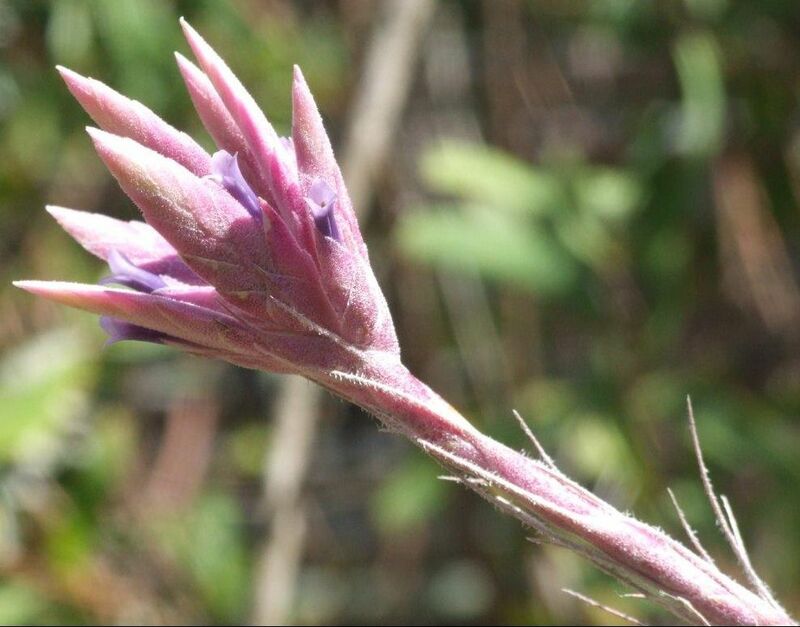 Therefore the first thing to do is use Hromadnik's key to check on wild collected plants. (see bottom of this page.) If you have problems with live plants called either rupicola or reducta join the club! Now to cultivars where you will find Enano Tectorum, Knize's Bolivariensis, Knize's Casmensis , and Llacanora in the BCR. If all fails just call it T. 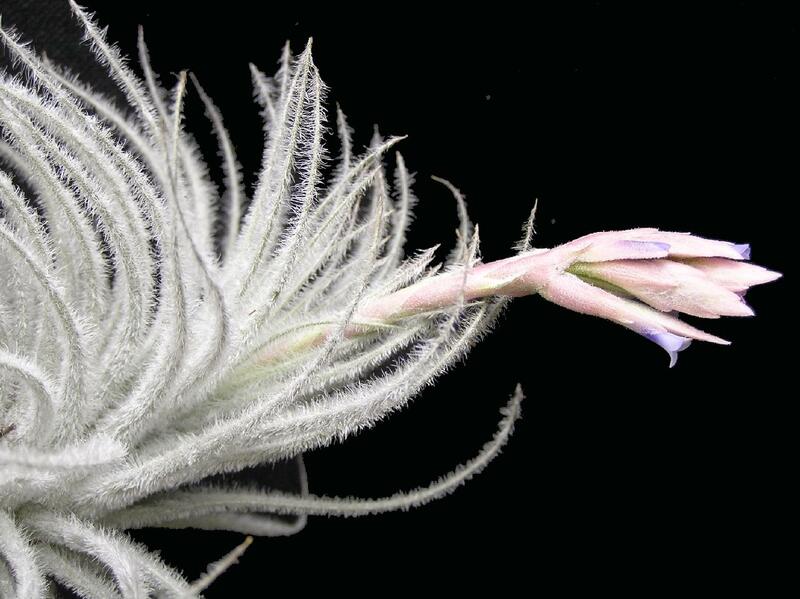 tectorum." 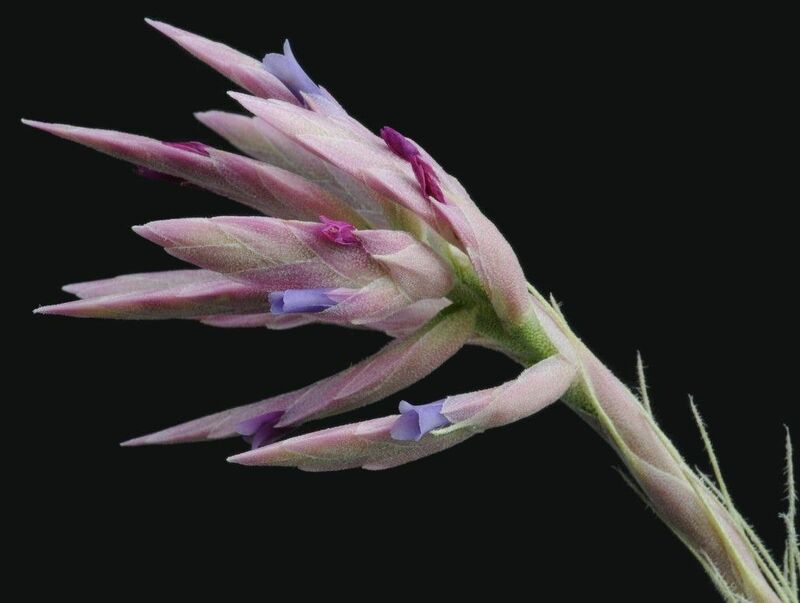 Rob Bower ... "Thanks – based on the key you sent mine is closest to tectorum tectorum. 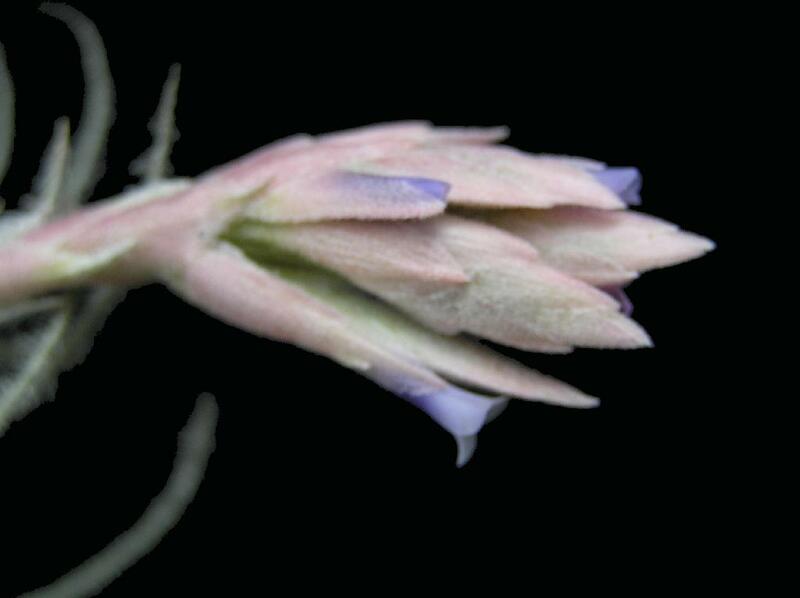 It’s a similar size and inflorescence structure as Llacanora but much more lepidote. Maybe its just tectorum again." 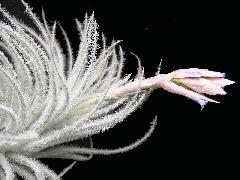 Andrew Flower ... "Derek - you suggest no-one has grown Tillandsia tectorum from seed. I guess incorrect assumptions need a correction, since I have grown 5 or 6 different populations from seed at least labelled "tectorum" from Knize. Now around 30 years old, some of them are reaching 5 to 6 cm long. I fear that identification in our lifetime is unlikely :-)"
Chris Larson ... "I got a stack of Nevilles tectorum seedlings many years ago. Selected from quite a number of different batches of seedlings. Some are flowering now. So ....."
Neville Ryan ... "To add to the confusion I have also grown T. tectorum from seed, I cross pollinated a large plant I had with a large plant of Olive Trevor. It would have been about 20 to 25 years ago, as the seedlings clump up before they flower it was a long time before they flowered, started flowering about 6 years ago. I have sold some of these plants over the years. My T. tectorum Enano were seedlings from Maurie Kellett, I don't know where that seed came from, there is some variation in the Enano plants, some are a lot larger then others. 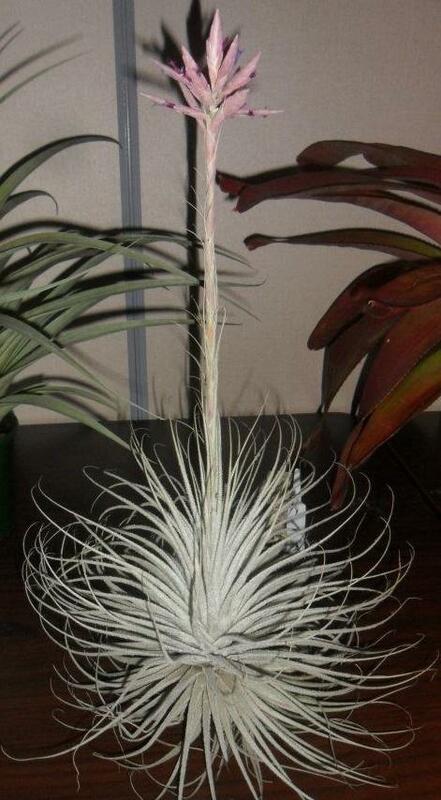 I have collected and grown a number of different clones of T. tectorum over the years. The only information I have most of the time will be who the plant came from, so I have plants with George, Dell, or PT, DS, GS, CL, MR on the tags. Some are numbered with the year that I took the first offsets off that clone. I wish you luck trying to sort them out." Grant Paterson ... "I have also raised many testorum from seed which have been sold all over. 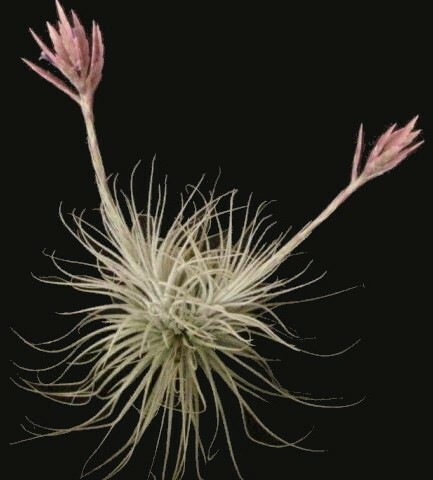 I have also purchased tectorum seedlings from others." 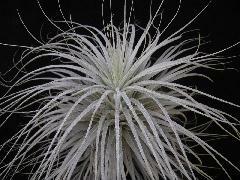 Pam Butler ... "I have a few tectorum seedlings of my own and also some from Neville. I will use the key and see if I can match it to my plants." Peter Tristram ... "I think that challenge has been answered – tectorums grown from seed in cultivation abound! I remember removing seeds from 6 tectorums that I imported about 1980, ex Ecuador I’d reckon. A few germinated and the first plant bloomed a few years ago (see pic 03/18 above) looking just like a couple of the mothers which are now on 50 cm+ stems - lovely giant tectorums that are in many of the old collections and rarely bloom and don’t self. Some of the smaller forms I bought from Lotte self and seedlings are slowly developing. As for reducta, it seems an easy one to figure to me. I did a TPE talk on tectorums once too – so many forms, some of which have species status. You can never have too many!" 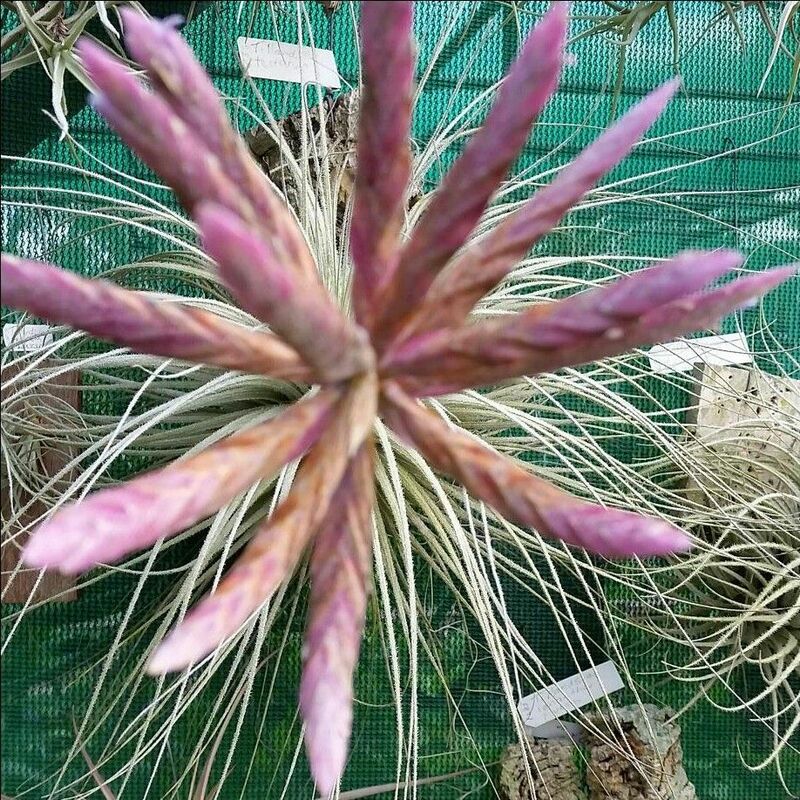 Derek Butcher ... "Now I have the attention of plant growers and seed growers, I assume it is T. tectorum v. tectorum that is mainly being grown from seed. I also assume that seedlings are being sold before flowering which means that this comment means any collector should be involved and should know the difference between a seedling and an offset. 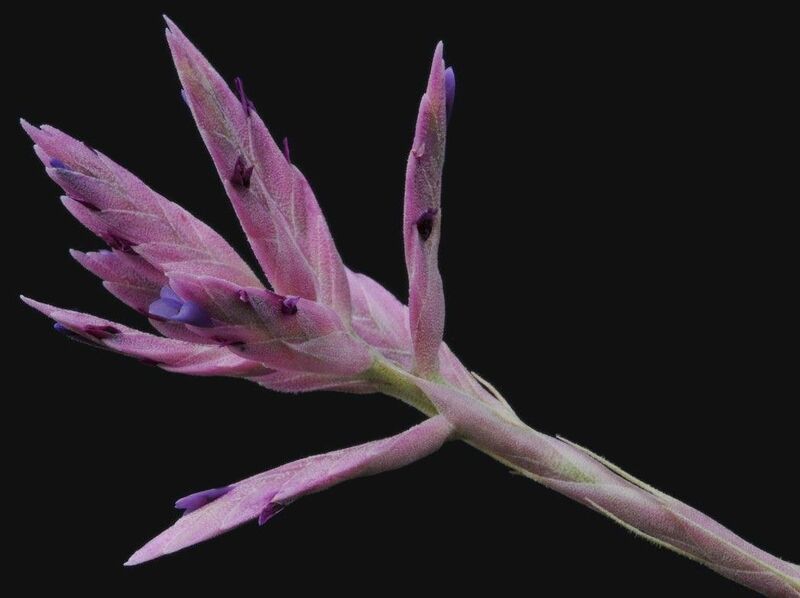 If we are looking for exceptional clones that could be given a cultivar name, to me they must be clear-cut, not like some T. ionantha. 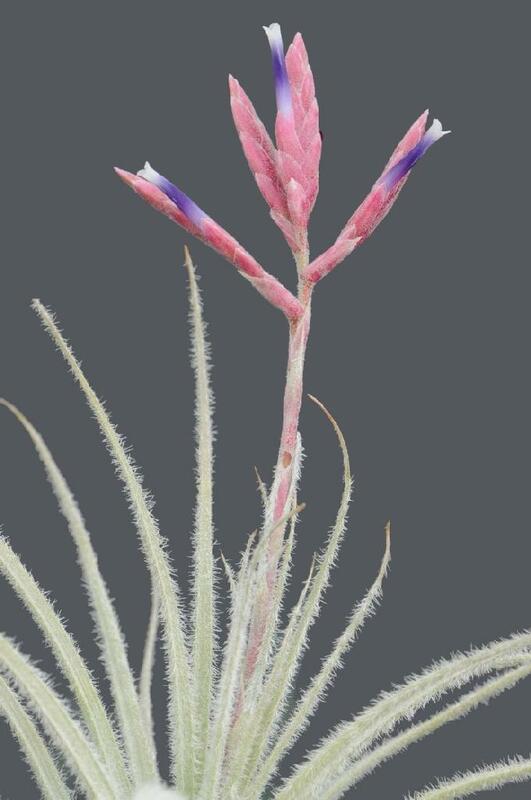 One starting point is T. tectorum v. tectorum with totally blue petals. How prevalent is this? Then to 'Enano Tectorum' mentioned by Neville. 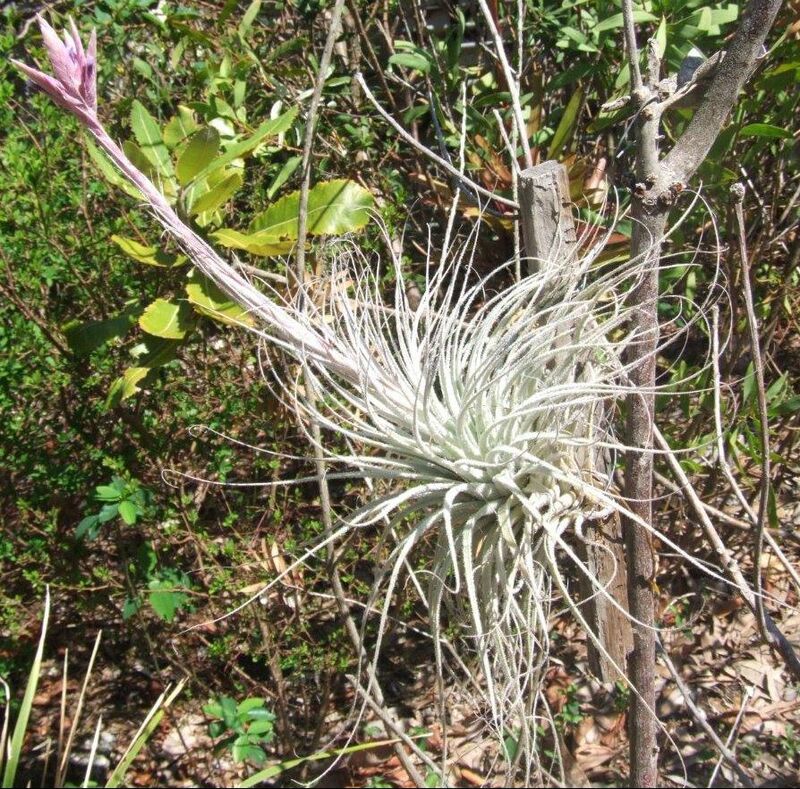 This leads to T. tectorum nana as grown in California. Perhaps Pam or others can shed some light on this." Tillandsia tectorum - Large form. Ken Woods. "30cm diam. 20cm high - still growing" 11/09. 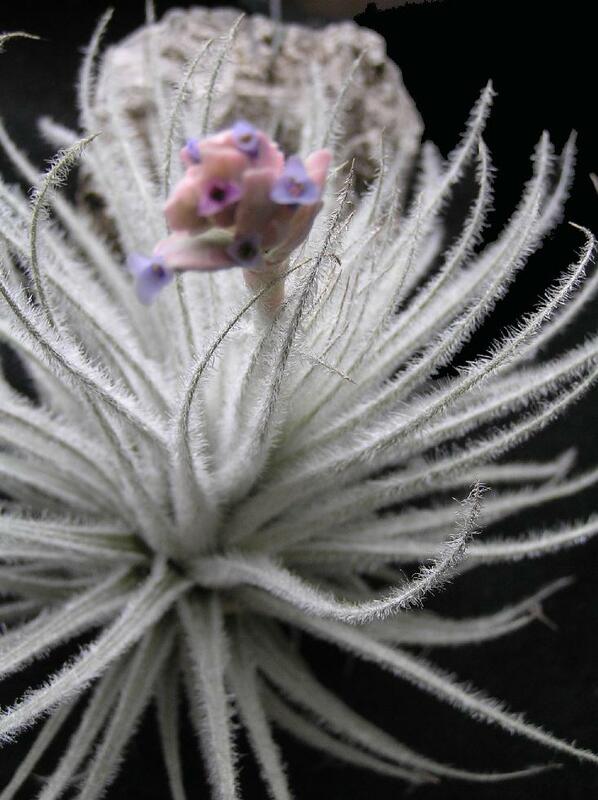 Peter Tristram .... "I got this little, stemless form of tectorum from Europe. 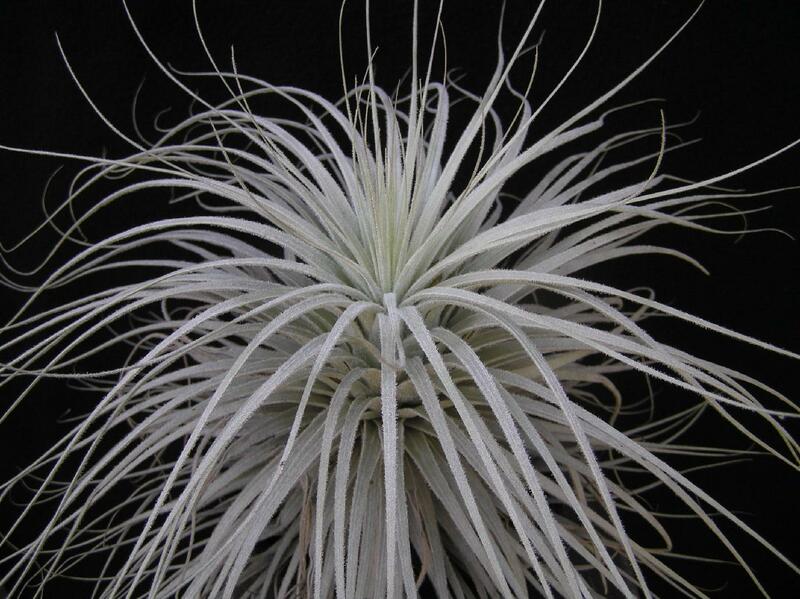 It is certainly distinctive and 1 or 2 are always in bloom, unlike most forms of tectorum that rarely bloom. It also self pollinates. 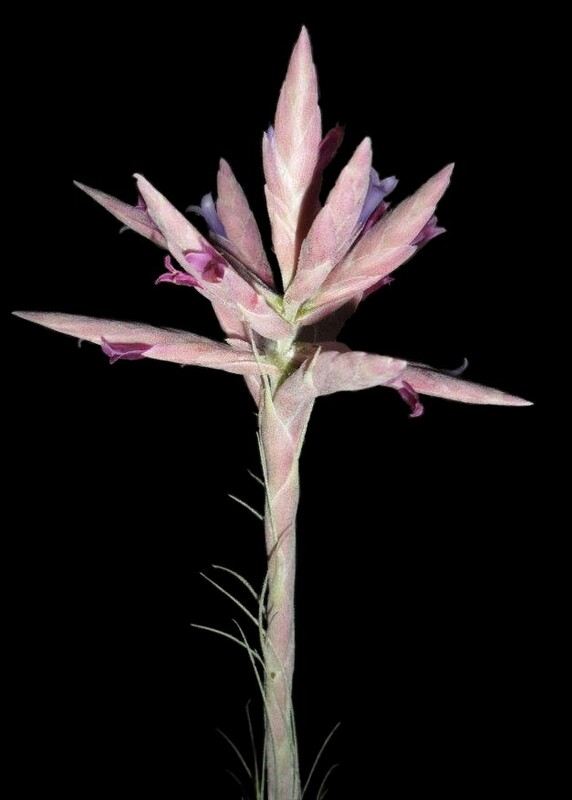 It has an interesting digitate inflorescence that is very attractive." Peter Tristram 05/10. Various clones.